A hoard of gold coins smuggled to London by a Jewish man who fled Nazi Germany will be returned to his descendents, a coroner has ruled. Max Sulzbacher's family buried the jar of "double eagle" gold dollars in the garden of their home in Hackney. But they were killed when a bomb hit their house during the Blitz, taking the details of where the coins were with them. 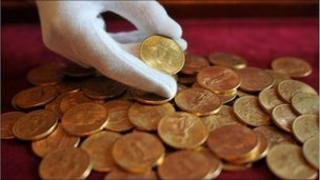 The coins, now being sold, are expected to fetch £80,000 at auction. They were minted between 1854 and 1913, and will be available to bidders at Spink auctioneers in Bloomsbury, London. The coins were found wrapped in greaseproof paper by Terrence Castle of Stoke Newington, north-east London, in the summer of 2007 while he was digging a frog pond in the garden of the property with three other people. Mr Sulzbacher, 81, a retired chartered accountant who lives in Jerusalem, said that he would be using the proceeds of the sale to give the finders of the coins a reward and to restore his family's gravestones at Enfield cemetery, north London. He said he was "surprised and delighted" by the find. Mr Sulzbacher's father, Martin, smuggled the coins to England, having sold all of the family's possessions in Germany. He was sent abroad to Canada at the outbreak of war, but when then the ill-fated Arandora Star he was on was torpedoed and sunk, he was sent to Australia. His wife and four children, including Max, were interned on the Isle of Man. His mother and father, brother Fritz, his sister and sister-in-law remained in London and buried the coins, before being killed by a German bomb. On his release, Martin Sulzbacher unsuccessfully had the garden searched. Some identical coins were found at the property in 1952 and he was able to claim them. It was that information that helped the British Museum, the coroner's office and the Museum of London to trace Max Sulzbacher this time. The coroner for Inner London North, Andrew Scott Reid, ruled the coins were treasure and that Max Sulzbacher, as an heir, was entitled to them. The coins are on display at the British Museum until the end of the week and one will be donated to the Hackney Museum. British Museum's head of the department of portable antiquities and treasure, Dr Roger Bland, said the find contributed to the story of Jewish immigration to Britain. "The case of the Hackney gold coins is one of the most unique and compelling stories that we have been involved with. "There is an incredibly human element to this story that is absent from many archaeological finds and we are pleased to see the coins reunited with their original owners after so many years." Martin Sulzbacher ran a book shop in Golders Green, north London, and died in 1981.